Saturday morning had the last of the celebrations. Brunch which consisted of yet more great food and, in particular, Maurie and Diane outdid themselves with gluten-free desserts – brownies, gingerbread, and biscotti – delicious! Marsha brought an unusual fruit combo – pomegranite seeds, avocados, and grapefruit sections. I think we can look forward to a Skein Lane Holiday cook book with recipes from all of our gatherings. No modesty here – we are as good as any TV food station. “Twas” a great time. Not only did we eat…but we celebrated some knitting projects. 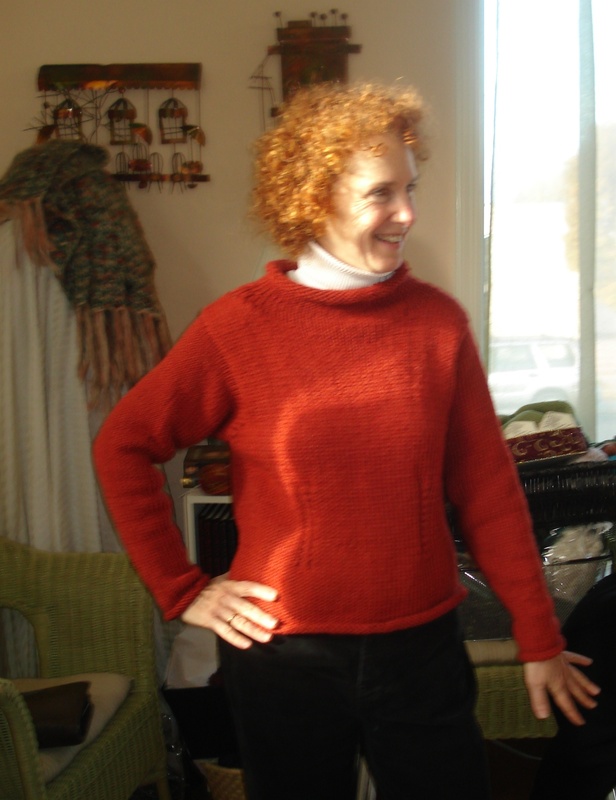 Shari just finished her self-designed sweater. She was inspired by a Margaret O’Leary design that she had in her closet and loved. 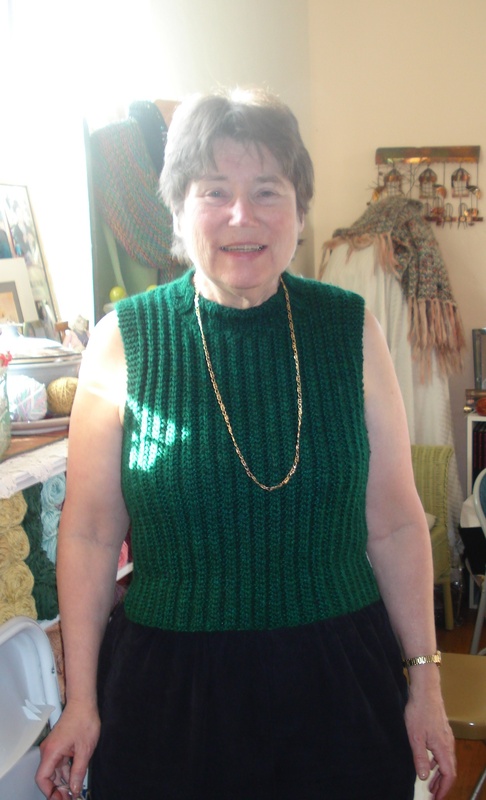 She used a different yarn…added some tucks in the mid-section to create shaping in the waist. This shaping was done with left and right twists. Terry and her new knit! Terry sent along this info re: her newly finished shell. “The stitch is called Cartridge Belt Rib. I got it in my Encyclopedia of Knitting. It is a two-row pattern that calls for multiples of 4 plus 3. I added selvage stitches on both ends. The first row (RS) is shown as knit 3, slip 1 with yarn in front, K 3. The second row is knit 1, slip one with yarn in front, K3, slip one with yarn in front, K 1. 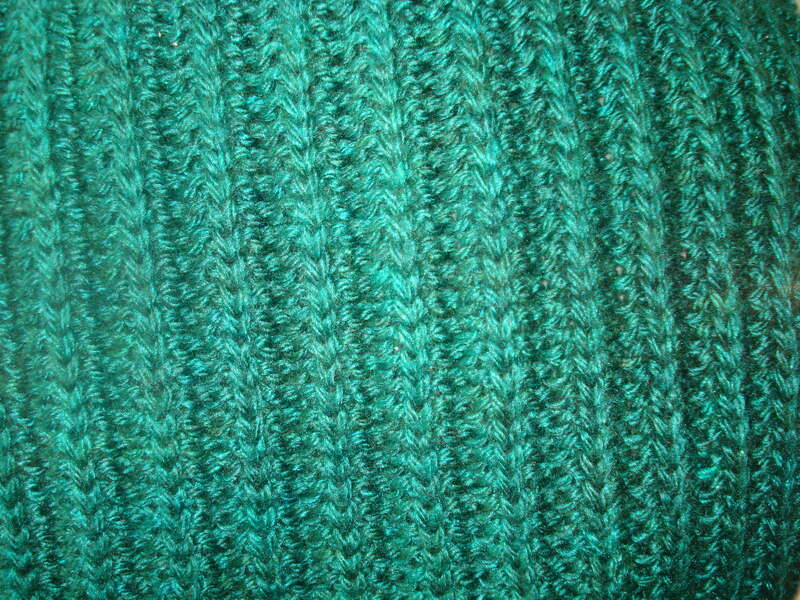 The slip stitches happen on the middle stitch of the K3 on the other row. It is a reversible pattern. The yarn is Cheesecake (silk and merino) from Art Fiber in Pinole.